Real estate agent Shawn Battle recently received a flood of questions about one of his listings from an agent representing a relocating buyer. The real estate agent could have answered all of the buyer’s questions. He sent an online 3-D model of the listing instead. Click the image above to use a Matterport virtual 3-D model for a Saratoga, California, listing handled by Alain Pinel Realtors. Battle is among a growing number of real estate agents who are using online 3-D models to win clients and prequalify buyers. The virtual models are a way for agents and brokers to differentiate themselves — for now. Some tech observers say they could become par for the course in the years ahead, as their cost plummets and user experience improves. If 3-D models become widespread, they could help weed out “lookie loos” who aren’t serious buyers, freeing up agents to spend more time as negotiators and navigators. But 3-D models could also make agents less important as tour guides and salespeople, both elements of their traditional value proposition to clients. Click the image above to use a virtual 3-D model produced by the broker Surefield. Jose Semorile, another agent at Century 21 Redwood, said showcasing his brokerage’s virtual 3-D listing models recently helped him secure a seller. He’s listed her three-bedroom home for $420,000. “When I showed her that 3-D model, that actually blew everybody else away,” Semorile said of competing agents who’d also hoped to land the listing. Semorile presented a model that his brokerage produced using a scanner sold by Matterport. (Click above to use one of Matterport’s virtual 3-D models above.) The $4,500 piece of equipment is currently the most popular 3-D camera among real estate professionals. Competing products may come to include a camera used by the Canadian firm Planitar, which it plans to begin selling to U.S. companies next year. Other U.S. firms like the startup Floored and the brokerage Surefield use their own cameras and software to produce 3-D models for clients (Floored for real estate firms, and Surefield for home sellers), but they don’t sell the cameras themselves. Scanning a home with Matterport’s camera involves placing it in dozens of positions around a house. The camera rotates 360 degrees in each spot to capture 2-D and 3-D data. Matterport’s cloud-processing platform later stitches all the data into a model for $19 in about 30 minutes. Scanning a 3,000-square-foot home takes somewhere around two hours for someone who knows what they’re doing. Brian Copeland, chief of broker services at Nashville, Tennessee-based Village Real Estate Services, claims the process is easier than shooting photos or video. “I could hand this to my 3-year-old,” he said. Inman’s video profile on virtual 3-D model provider Floored. 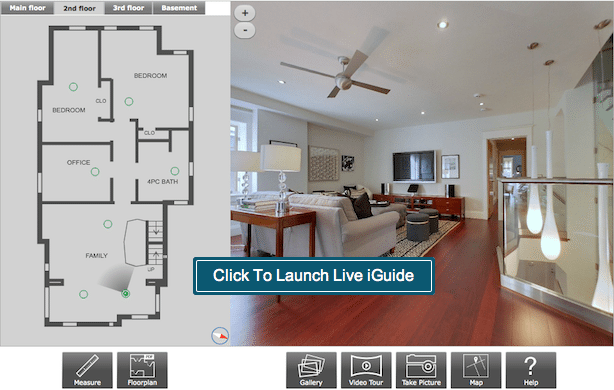 The broker specializes in constructing virtual models of unbuilt units based on computer-aided designs (CADs), but also uses a proprietary camera to create tours of existing homes. One broker has staked its business model on virtual 3-D models. Surefield, launched this spring by Redfin co-founder David Eraker, has used its own camera and software (not Matterport’s) to produce models for more than a dozen listings. “The process of dealing with home tours is dramatically improved because a homeowner can allow buyers to basically prequalify themselves,” Eraker said. That makes it possible for Surefield’s models to capture bright outdoor spaces. Matterport’s models cannot do that because sunlight jams the infrared sensors on its camera. Another advantage to Surefield’s models is that they load faster than Matterport’s. The downside to Surefield’s models is that their picture quality is poorer than Matterport’s, and they do not include a 3-D “dollhouse.” Matterport’s “dollhouses” let users view models from different perspectives, including a bird’s-eye view. 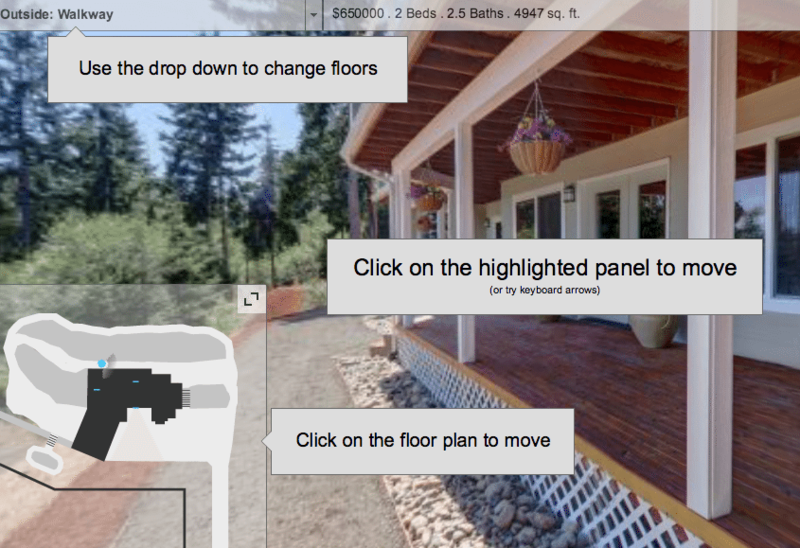 Some observers predict that 3-D representations will become standard for listings in the future. Six out of 10 Inman readers who responded to an Aug. 21 poll said they think so. And there are signs to suggest that they may be right. Some listing portals have also given buyers a taste of 3-D (though none have added full-blown 3-D models). Apartment List has produced “photo-sphere tours,” series of 360-degree photographs that aren’t baked into a virtual 3-D model, for more than 30,000 apartment units, while local Web portals such as NJ.com, Syracuse.com and OregonLive.com now offer 3-D floor plans generated by DIAKRIT. One reason why some agents see big things for 3-D offerings is that they’ve gotten much more affordable and realistic in recent months. That should only continue as computing power and competition among 3-D tech providers grows. Brokers or agents that aren’t ready to pony up $4,500 for Matterport’s camera can commission marketing firms to produce them for rates comparable to those charged by some photographers. Home ScanD, which popped up to produce online 3-D models in the Southeast, charges $200 per listing. Floored, a company that produces high-end 3-D models using a different camera and software than Matterport, says it’s halved production costs in the last 18 months ago. Mobile devices with 3-D scanners and virtual reality technologies like Oculus Rift, which converts 3-D models into immersive experiences, will only further fuel adoption. The video above, published by TechCrunch, shows a person using a prototype of a 3-D-sensing mobile device produced by Google that can generate a virtual 3-D model using Matterport software. “I can imagine an agent handing me an Oculus Rift and saying lets take a tour of three or four homes right here,” said Jamie Goldman, vice president of ePlatforms at ERA Real Estate. ERA recently made its first foray into 3-D by adding a virtual staging tool to a swath of its luxury listings. Many of those who are bullish on 3-D virtual models expect the technology will save buyers the wasted time of visiting listings that quickly turn out to be disappointments. They could even spur more relocators and foreign buyers to purchase properties without ever seeing them in person — a practice that video chat apps have already fueled. The saved time for consumers could trickle down to real estate agents, helping them to further evolve into “less a finder of homes and more a counselor of how to get the right home,” said Kendyl Diggs of Montrose, California-based DIGGS, a division of Dilbeck Real Estate Living. But if 3-D technology reduces the need for showings, that could diminish agents’ traditional role as tour guides — a source of leads and part of their value proposition to some consumers — and put downward pressure on the commissions of real estate agents, particularly those representing buyers. Surefield encourages prospective buyers to review its virtual 3-D models of listings before deciding whether to schedule a visit. That way, the broker only has to coordinate showings for the most promising buyers. The time and money Surefield says it saves by setting up fewer showings per listing than most other brokers is part of the reason why it can charge sellers a rock-bottom commission rate, Eraker said. The other reason is a listing strategy that the broker has conceived to free sellers from having to “prepay” a typical buyer’s agent commission. Virtual 3-D models, Eraker contends, introduce a level of efficiency and information into the market that should offer consumers more flexibility when negotiating commissions with real estate agents. Surefield charges a 1.5 percent commission that includes a fee of $2,000 that’s earmarked for the buyer’s agent — if the buyer is represented. If a buyer is unrepresented, Surefield uses the $2,000 to cover attorney fees for the buyer. The $2,000 would amount to a bargain-basement commission for buyer’s agents, just 0.5 percent on a $400,000 home, compared with a typical buyer’s agent commission of 2.5 ($10,000) or 3 percent ($12,000). The strategy doesn’t make it impossible for a buyer’s agent working with Surefield to take home a typical commission. But it does make the buyer’s agent’s commission more of a matter of negotiation. Eraker knows Surefield’s business model could stir the pot, but he argues that the ubiquity of listings online will make it challenging for buyer’s agents to steer their clients away from Surefield listings — a strategy he wouldn’t expect buyer’s agents to use anyway. “We’re bringing the United States up to the same level of efficiency that exists everywhere else in the world,” Eraker said, referring to countries like Australia, where buyer’s agents hardly exist. By putting yet even more information online, 3-D models might also chip away at real estate agents’ ability to “sell” a buyer on a home. “Other listing agents have told us, ‘Yeah, great, that model is really nice, but I would probably just do a model of the interior and the kitchen; I wouldn’t want to provide prospective buyers with all of that information,” Eraker said. That’s because some listing agents want to get as many potential buyers in the door as possible. Buyers might be willing to give a home more of a chance, some agents reason, if they see it in person with an agent who can highlight everything the place has to offer. Battle, the agent who sent a 3-D model that a relocating buyer used to rule out a listing, also noted that a “house can work against itself,” making it disadvantageous to fully expose it online. “If it doesn’t show clean, and you think it would be a detriment, you just won’t do a 3-D tour,” he said. Editor’s note: This story has been updated to correct that Planitar’s 3-D product is called an iGuide, not an iTour.